How Much Will the ISIS Fight Cost? The same Pentagon program that provides surplus military equipment to local police departments has also provided heavy armor and weapons to school districts, and a group of civil rights groups are calling for an end to it. 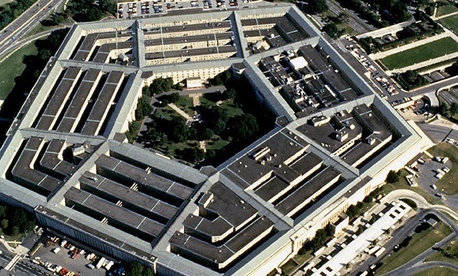 A coalition spearheaded by the NAACP and Texas Appleseed, a social justice organization, on Monday sent a letter to the director of the Pentagon's Defense Logistic Agency urging the department stop sending military equipment to schools under the so-called 1033 program, which has come under intense scrutiny following the police crackdown last month in Ferguson, Mo. The groups cited data showing that 22 school districts in eight states participate in the surplus transfer program, with 10 of them in Texas. Talking Points Memo first reported the letter. In their letter to DLA director Mark Harnitcheck, the groups wrote that the events in Ferguson following the police shooting of an unarmed teenager "demonstrate the tensions that invariably develop between local law enforcement and the community when military equipment is unnecessarily deployed against citizens." Adding the presence of military-grade weapons to school climates that have become increasingly hostile due to their overreliance on police to handle routine student discipline can only exacerbate existing tensions, intensifying overly punitive atmospheres that criminalize and stigmatize students of color." According to data sent to The Wire from Texas Appleseed through the Texas Department of Public Safety, the gear transferred to school districts includes assault rifles, trucks, night-vision equipment and other armor valued in the hundreds of thousands of dollars. Congress first enacted the 1033 program more than 20 years ago as a way to make use of excess military equipment and help local law enforcement combat drug gangs. The demand grew in the years following the Sept. 11 terrorist attacks, and the supply of surplus of equipment has grown as the U.S. withdrew forces from Iraq and Afghanistan. The transfers to school districts also coincide with calls for more heavily armed officials to protect schools following several mass shootings, most notably at Sandy Hook Elementary School in Newtown, Conn. in 2012. The groups acknowledge in their letter the desire for protection after Sandy Hook, but they write that "research concludes that there is no evidence that these types of weapons would be effective in combating or responding to these situations." The aggressive police tactics in Ferguson and images that resembled foreign war zones prompted a backlash against the "militarization" of local law enforcement, and both the White House and Congress are reviewing the 1033 program. Federal support of the 1033 Program’s lending of military weapons to local school districts is in contravention of these efforts to minimize police presence in schools. In fact, it appears to place the federal government’s imprimatur on arming school police with high-powered military weapons. These harmful practices are unacceptable for our nation’s students." The Wire has reached out to the Pentagon for a response to the letter from the civil rights groups.